Each February, thousands of UT alumni around the world gather together to give back to their communities for Project Worldwide, a monthlong service initiative hosted by the Texas Exes and the Division of Diversity and Community Engagement. 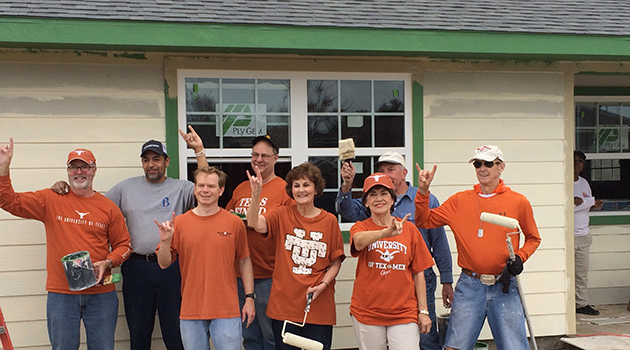 The effort is an extension of The Project, UT’s longstanding and largest day of service. Since 1999, students, faculty, and staff have devoted the last Saturday of February to beautifying Austin through the university-wide service initiative. Meanwhile, Texas Exes’ Project Worldwide offers UT alumni the opportunity to continue giving back to their communities even after they leave the Forty Acres. This year marks the fourth annual Project Worldwide. With higher participation than ever before, 66 communities from the East Coast to the West were served by Longhorns throughout the month. While the Philadelphia Chapter hosted a Texas-style brunch for transplant patients and their families, the San Francisco Chapter planted trees along their streets. Back in Texas, the Amarillo Chapter fought weekend hunger by providing food to children in the Panhandle, and the Laredo Chapter participated in a Rio Grande River clean up. Five international chapters also joined in this year’s service effort. In Mexico City, UT alumni collected and personally delivered clothes and goods to homeless children in the community. Chapters in Nigeria, France, Hong Kong, and Taiwan donated their time and energy as well and helped make Project Worldwide a truly global event. Above: Members of the Texas Exes Brazos Valley Chapter volunteered with Habit for Humanity.